Multi-Room Audio Systems - M31 Inc. - "applied digital science"
Also known as whole house audio, these systems allow you to listen to various audio sources in some or all of the rooms in and outside your home. 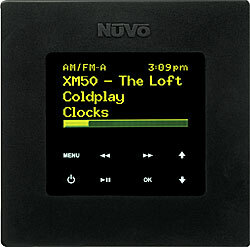 Typical sources are AM/FM radio, internet radio, MP3 players, music servers, CD juke boxes, etc. From a historical perspective, some of the first multi-room audio systems were intercoms. The intercom master station or base station contained an AM/FM radio, and each room with an intercom substation, in addition to paging functions, could listen to the radio station that was tuned by the master/base station. We still see updated versions of these today but there are better systems available. Intercoms usually had only one speaker, so stereo was not available. They usually had very low power, maybe 1 watt, and the speaker was not a high fidelity speaker, so the quality of music was limited. 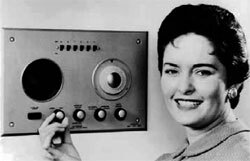 While later intercoms had inputs for other music sources, most were limited to one radio tuner only, and every intercom substation had to listen to the same source. The next step to a more advanced system was a stereo amplifier or receiver connected to a speaker selector. The speaker selector had on/off buttons for the stereo speakers in each room or “zone”. Electronics in the speaker selector divided the power of the amplifier among the zones that were selected. Some speaker selectors also contained individual volume controls for each zone, but it was more convenient to place the volume control on a wall plate in the zone. The stereo speakers in each zone were much higher quality than intercom speakers and were usually mounted in the ceiling instead of the wall. These systems represent the least expensive implementation of multi-room audio. While this was an improvement over the intercom system, it still had some drawbacks. The electronics in the speaker selectors and volume controls degraded the sound quality significantly, but it was considered acceptable for “background music”. And while you could adjust the volume in each zone, you could not switch sources, say from CD player to radio. There was also no control of the source, like changing the radio station. For anything other than adjusting the volume, you had to make a trip back to the main amplifier or receiver and make the changes there. Finally, all the zones were still tied to the same source, so you could not listen to radio in one room and CDs in another for example. The next leap forward for multi-room audio was the multi-channel amplifier with keypad controls. Now there was a dedicated amplifier for each speaker. A 6 zone system would have a 12 channel amplifier (6 stereo pairs) and 6 keypads, one for each zone. A typical system would have 4 to 6 source inputs so a variety of audio sources could be attached. The keypads would allow not only volume control but source selection as well. Some systems had IR capability, so the source equipment could be controlled from the keypad. For example, you could change to the next radio station, or skip to the next track on a CD. Sound quality was greatly improved by removing the speaker selector and volume controls. The new volume controls actually controlled the amplifier gain instead of just attenuating the speaker level signal. Some keypads even had displays so you could see what radio station you were tuned to, or which track on a CD was playing. The latest versions of this system allow metadata to be displayed on the keypad, so you can see not only the radio station information, but also the artist, album, and song name. These newer versions have iPod integration so you can see playlists, album art, etc. The most expensive systems had large color touch screens, eliminating the keypad buttons. While these systems cost more than a simple speaker selector with volume controls, they are much more functional and sound better. The only remaining draw back to sound quality was the long runs of speaker wire from the multichannel amplifier to the speakers. For best sound quality, a speaker wire should be as short as possible. For typical 16 gauge speaker wire, anything longer than 30 feet starts to compromise the sound quality. For multi-room audio systems installed in larger homes, 300 foot speaker wire runs are not uncommon. The development of the digital audio amplifier solved this final issue with high quality audio in multi-room audio systems. Digital audio amplifiers are extremely efficient, very small and dissipate less heat than analog audio amplifiers. This allowed the amplifier to be distributed right out to the zone. 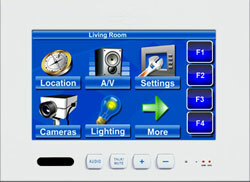 They are installed on or very near the keypad or touch screen controller so speaker wire runs are minimized. In some installations the digital amplifier can be installed right on the back of the speaker. Quite often these new systems are easy to retrofit. A power supply replaces the old multi channel amplifier and attaches to the speaker wires to carry low voltage power to the digital amplifiers. The network cable now carries the analog or digital music to the digital amplifier. We have come a long way since the original intercoms, but the intercom features have been integrated into some of the newer multi-room audio systems. These systems include microphones in the keypads so you can talk to people between rooms. Doorbell microphones let you talk to someone at your front door. When the doorbell is pressed, music is muted in the zones so the doorbell can be heard. Paging is implemented so you can page someone in all the zones at once. Keypads can be very sophisticated, with large color touch screens. These keypads display a rich graphical user interface and can also display video from security cameras. From a simple volume control system to elaborate distributed amplification systems, M31 Inc can sell, install and service your multi-room audio system. Give us a call today and let us know how we can help you get beautiful music all around your home!